As I am still travelling, I am so happy to be done with these products because they were quite bulky compared to the rest of what I have and while I’m sad to be finished with them, it does feel good to have lightened my travel load. Caprylic/Capric Triglyceride, Helianthus annuus (Sunflower) Seed Oil, Capric/Caprylic/Triglycerides, Water (Aqua), Glycerine, Propanediol, Glyceryl undecylenate, Aroma**, Sucrose Stearate, Decyl Glucoside, Oryza sativa (Rice) Extract*, Glyceryl Caprylate, Lactobacillus/Punica granatum Fruit Ferment Extract, Papain, Curcuma Zedoaria Root Oil, Magnesium Aluminum Silicate, Sucrose Palmitate, Zingiber Officinale Root Oil, Salix alba (Willow) Bark Extract*, Eugenia Caryophyllus Flower Oil, Sucrose Laurate, Abies PectinateLeaf Oil, Foeniculum Vulgare Oil, Aloe Barbadensis Leaf Extracts, Kaolin, Bioflavanoids, Leuconostoc ferment filtrate, Montmorillonite, Mica, Brassica Oleracea Italica (Broccoli) Extract, Superoxide Dismutase, Soybean Peroxidase, Citral, Citronellol, Eugenol, Geraniol, Linalool, Limonene *Ingredients from Organic farming **Clinical grade essential oils blend. This one is a bittersweet finish because I am glad to no longer have to lug this heavy glass bottle around but I am disappointed to be finished with the cleanser because it’s one of my absolute favourites and I don’t have a replacement yet! I have talked about this cleanser here and here as well as extensively on my Instagram so I won’t say too much more other than if you are looking for a cleanser that will purify your skin without drying it out then this is it. It is so great for those with oily/combination skin (although I would recommend it for anyone), especially during this time of year because it creates a balance where congestion is prevented without creating dehydration. I love this as my second cleanse in the evening or as a morning cleanse, and as I have said before, it works extremely well as a mask, on it’s own or mixed with the Resurfacing Mask. I can’t recommend this cleanser enough. Repurchase? Yes, just not while I am travelling. Aqua, Aloe Barbadensis Leaf Juice, Hamamelis Virginiana (Witch Hazel) Leaf Extract, Aesculus Hippocastanum (Horse Chestnut) Seed Extract, Glycolic Acid, Ammonium Glycolate, Glycerin, Butylene Glycol, Hexylene Glycol, Glucose, Fructose, Sucrose, Urea, Dextrin, Alanine, Glutamic Acid, Aspartic Acid, Hexyl Nicotinate, Panax Ginseng Root Extract, Phenoxyethanol, Sodium Benzoate, Biotin, Polysorbate 20, Fragrance. I have used Glow Tonic for many years and can safely say that it is a great exfoliating toner for gently adjusting the pH of the skin post cleanse without being too harsh or irritating. This “acid toning” step is so important in keeping skin clear and healthy and really should be done AM and PM. Glow Tonic has recently gone through some packaging changes (with it now being sold in the U.S.) and the ingredient list now includes Butylene Glycol, Hexylene Glycol and Aspartic Acid. To be clear, the formula has not changed at all, just the label. 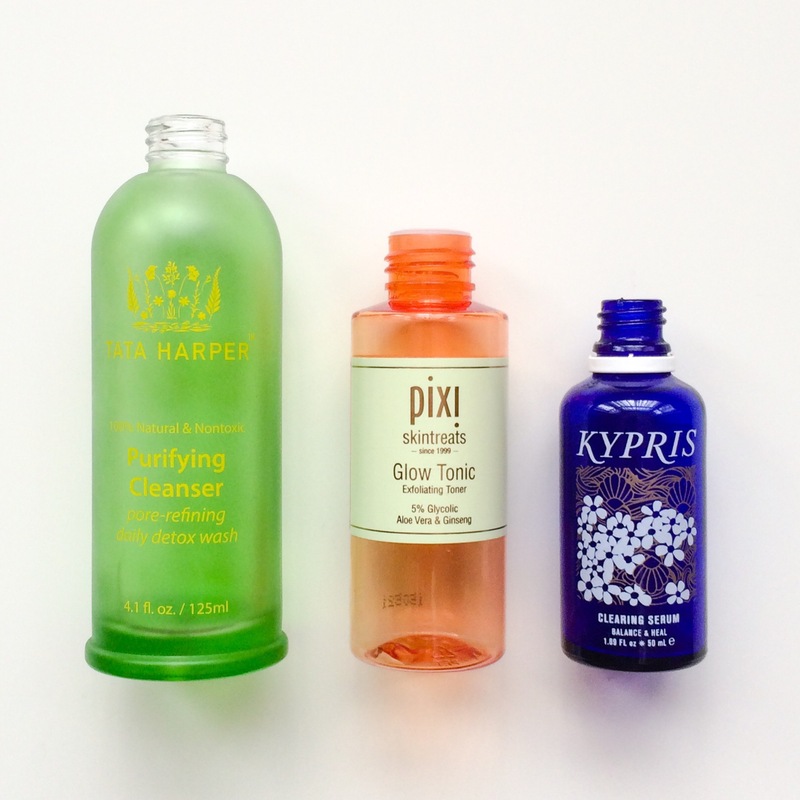 These three “new” additions have always been in Glow Tonic but were previously not listed. Pixi emailed me to confirm this stating that the current Glow Tonic formula is exactly the same as the original. Thinking about it, I’m not sure how I feel about that. I don’t think it’s fair that any product should be sold without giving the consumer a chance to know exactly what they are getting and just because an ingredient doesn’t have to be listed (solvents/carriers) doesn’t mean it shouldn’t be. I think as paying customers we have the right to know exactly what we are buying. I have three bottles with labels displaying three different ingredient lists and I am quite confused and disappointed by this. Repurchase? Maybe, but I am trying Bravura London’s Ginseng Toner next. I am massively disappointed to be finished with this. I talked about it here in my September Favourites and hate that now a month later, it’s in my empties. This product is one of the nicest serums I have ever used and I loved the effect it has on my skin. It’s packed full of excellent ingredients that balance, heal and soothe the skin. It’s incredibly light, layers well with other products and because of the Apple extract, smells incredible. It’s such a delight to use, is gentle enough to be applied daily and I highly recommend it for anyone who wants to tackle blemishes the plant based way. Organic Aloe Barbadensis (Aloe Vera) Leaf Juice, Psidium Guajava (Guava) Fruit Extract, Behentrimonium Methosulfate, Helianthus Annus (Sunflower) Seed Oil, Helianthus Annus (Sunflower) Seed Wax, Cetearyl Alcohol, Argan Spinosa Kernel Oil, Olea Europaea (Olive) Fruit Oil, Butyrospermum Parkii (Shea) Butter, Punica Granatum (Pomegranate) Seed Oil, Glycerin (Vegan) Aroma, Guar Hydroxypropyltrimonium Chloride, Caprrylic Acid, Potassium Sorbate. Deep Steep are probably my all time favourite bath and body brand and I have loved using these while travelling. I found this scrub to be incredibly hydrating because of the Argan oil and it did a great job at keeping my skin soft and smooth without being too harsh or causing any irritation. Sadly, this was limited edition and is no longer available BUT Deep Steep have a whole range of other amazing smelling scrubs and I would highly recommend them. If you’ve never tried anything from Deep Steep, you really should. They use great ingredients, have lovely scent combinations and are very reasonably priced. Repurchase? I would if I could but I am happy to move on to one of their other amazing scents! Aloe Barbadensis (ORGANIC Aloe Vera) Leaf Juice, Sclerotium Gum, Argania Spinosa Kernal (ORGANIC Argan) Oil, Caprylic/Capric Triglyceride (Plant Derived), Helianthus Annuus (ORGANIC Sunflower) Seed Oil, Natural Vegetable Glycerin, Coco-Caprylate/Caprate, Glyceryl Stearate (Plant Derived), Butyrospermum Parkii (ORGANIC Shea Butter), Polysorbate-60 (Plant Derived), Vanilla Planifolia (Vanilla Bean) Fruit Extract, Persea Gratissima (ORGANIC Avocado) Oil, Beta Carotene, Ethylhexylglycerin (Plant Derived Preservative), Tocopherol (Antioxidant), Prunus Armeniaca (Apricot) Fruit Extract, Aniba Rosaeodora (Rosewood) Wood Oil, Citrus Aurantifolia (Lime) Fruit Extract, Citrus Aurantium Dulcis (Orange) Fruite Extract, Citrus Grandis (Grapefruit) Fruit Extract, Cocos Nucifera (Coconut) Oil, Symphytum Officinale (Comfrey) Leaf Extract, Matcha Tea Extract, Camellia Sinensis (White Tea) Leaf Extract, Allantoin, Panthenol (Pro-Vitamin B5), Helianthus Annuus (Sunflower) Seed Extract. I am such a huge fan of this body butter and can’t even begin to count how many times I have repurchased it over the years. It smells absolutely incredible, is full of excellent ingredients (many of them organic) and just feels so lovely on the skin. It’s thick but not heavy and leaves the skin feeling hydrated but not slick or greasy. The scent is mild and sweet (but not sickly) and lingers without being overpowering. I really miss the jumbo pot they used to do as these regular ones run out so quickly. I love all the new smaller pots they have available at Sephora now. It’s such a great way to try a new scent without committing to a full size and perfect for travelling. Cucumber Aloe, Honeysuckle Vanilla and Tropical Orchid are at the top of the list to try next but really, they all sound good. Deionized Water, Cocos Nucifera (Coconut) Oil*, Butyrospermum Parkii (Shea Butter)*, Vegetable Glycerine, Simmondsia Chinensis (Jojoba) Oil, Hibiscus Flower Extract, Citrus Medica Limonium, Citrus Aurantifolia, Jasminium Officinale, Slippery Elm Extract, Essential Oil Blend, Behentrimonium Chloride (Conditioning Salt), Algae Extract, Hyssopus Officinalis Extract, Salvia Officinalis (Sage) Leaf and Equisetum Arvense Extract, Althaea Officinalis Extract, Tocopherol (Vitamin E) *Certified Organic Ingredients. I stole this from my sister just over a year ago and have been in love with it ever since. I have curly/wavy hair and this has been so nice to use post wash to quickly and easily remove any tangles without damaging the hair. I also found it to be nicely hydrating and smoothing, leaving no residue or any build up. The ingredients are simple but good quality (some organic) and really work to improve the quality of the hair. I think Shea Moisture are a great brand if you are looking for affordable, good quality, plant based hair care products because they have a range to suit every need. Please feel free to comment with your empties from last month. 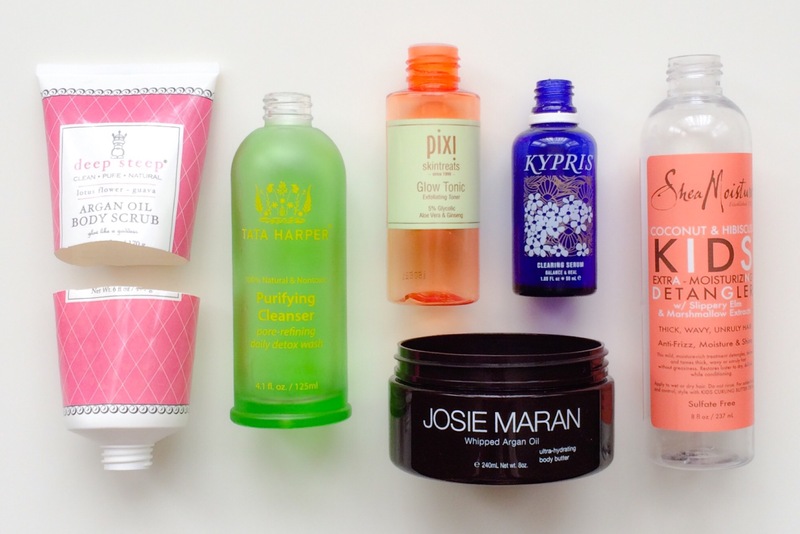 I’d love to hear your thoughts on what you used up and if you’ll be repurchasing them. What a great post. You are both thorough and concise. I wish I could master the art. LOL! I did not know that Target now ship to us here…thanks for letting me know. The detangler sounds like just what I need. I’m looking through the Deep Steep site and all their scents sound amazing! 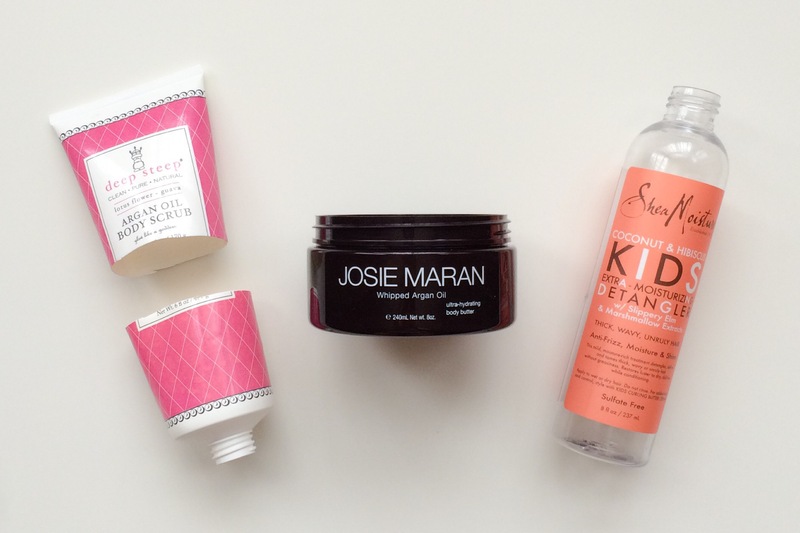 The Honeysuckle Vanilla Josie Maran body butter sounds like it would smell incredible as well – I just need to finish up my current lotion so I can check these out! Don’t they?! 😍 I really need get more from them. I am currently down to one tub of body butter that I’m finishing up. 😩 Oh man, the JM Honeysuckle Vanilla?!!! I haven’t had a chance to sniff it out yet but I am SURE it will be wonderful! 🙌🏽 What are you using now? !